As of October 5th, 2014, we are ordering supplies and working on pre-design for a suborbital and orbital variant of the rocket; the weather balloon 'vehicles' that we will use to validate flight matierials, sensors, computers, and other equipment is ready for a first flight, while the equipment still needs to be refined and worked on. 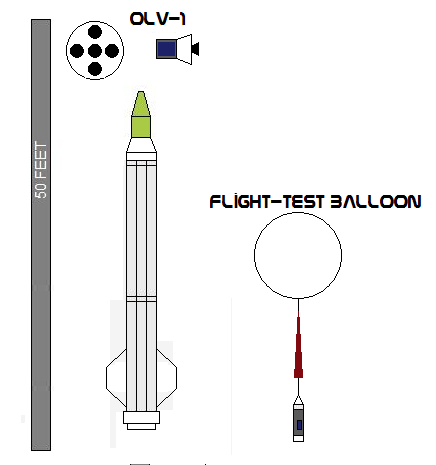 One proposed design is that of the OLV-1A, of which a basic visual is posted on the thread along with the design of the weather balloon. The suborbital vehicle is being heavily debated on as to incorporate it as a rockoon or base it off the GoFast rocket. CURRENT STAGE (FT-Balloon): Preparation for flight. ANNOUNCEMENT: It has been decided to launch our avionics package onboard a weather balloon to the height of 65,000ft and return it safely to Earth by the end of October. I helped launch the second GOFAST rocket last July, a very reliable booster if you were to use it though you would not meet the cost limitations of the N-Prize with it (essentially an Up Aerospace rocket using a Cesaroni S class motor. But even if you were to orbit as an amateur team that would be one giant step for others to reach space and customers would come to you. rick m wrote: I helped launch the second GOFAST rocket last July, a very reliable booster if you were to use it though you would not meet the cost limitations of the N-Prize with it (essentially an Up Aerospace rocket using a Cesaroni S class motor. But even if you were to orbit as an amateur team that would be one giant step for others to reach space and customers would come to you. Of our (planned) space vehicles, only the orbital rocket is designed to fit within the N-Prize requirements, meaning that constructing a GoFast rocket will not factor in the cost. We intend to use the suborbital rockets as a major stepping stone to its orbital big brother, much like NASA intends to use an asteroid as a stepping stone to Mars. On the other hand, I've decided to set a deadline of 90 days to design, build, and launch the suborbital version. As of current, we're performing ignition tests on the fuel (Parrafin wax and Nitrous Oxide). NAeronautics wrote: On the other hand, I've decided to set a deadline of 90 days to design, build, and launch the suborbital version. As of current, we're performing ignition tests on the fuel (Parrafin wax and Nitrous Oxide). Any update on progress for the nitrous suborbital version? With it be self-pressurized or are you planning on using Helium or another gas?